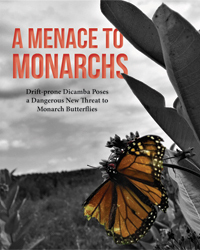 TAKE ACTION: Tell the EPA to revoke its approval of dicamba to help save monarchs. Already imperiled by escalating pesticide use and other human activities, monarch butterflies’ epic annual migration across North America now faces a dangerous new threat. Take action now to help them. milkweed, the only plant that feeds monarch caterpillars. We were particularly concerned with examining the effects of the recently expanded use of dicamba, which is projected to increase by nearly 100-fold on cotton and soybean fields within monarch habitat by 2019. This map shows the locations and timing of recorded monarch eggs and larvae during a representative year, along with the locations and timing of dicamba spraying periods for cotton and soybean crops nationwide. As time passes, the monarch egg and larva observations (white butterfly icons) begin to appear in accordance with their observation. The areas where cotton (yellow) and soy (red) crops are grown become visible when dicamba is anticipated to be sprayed. We'd like to give a huge thanks to the team at Journey North and all the amazing citizen scientists who collected data used in our map.